What ever happened to home field advantage? It used to be that, in the NFL, the home team had a distinct advantage especially when it came to divisional opponents. But over the past three weeks, there have been a rash of visiting team victories. Looking at the 18 divisional games in the NFL over that period, there were 12 games won by the visiting team. 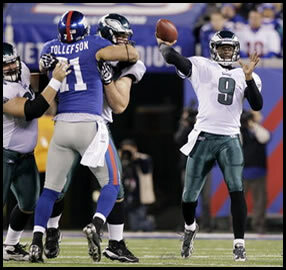 Sunday night the then-first-place New York Giants were defeated at home by the then-last-place Philadelphia Eagles. It was the Giants’ fifth consecutive home loss to the Eagles, all of which took place during winning seasons for the Giants. Further, the Eagles did it with some key injuries at key positions and with backup quarterback Vince Young at the helm. The past few weeks have seen even more profound divisional games won by the visiting team, some during important “showdown” match-ups. Last week, the Steelers beat the Bengals in Cincinnati, in a battle for first place in the AFC North a week after losing to the Baltimore Ravens in Pittsburgh. That same night the Jets got crushed at the Meadowlands by the New England Patriots relinquishing their top spot in the AFC East, a week after New York defeated the Bills in Buffalo to gain that top spot. In a third battle for first place last week, New Orleans traveled to Atlanta and defeated the Falcons in overtime. Other oddities abound. The Oakland Raiders went on the road to beat San Diego after losing consecutive games at home against their division rivals Kansas City Chiefs and Denver Broncos. Speaking of the Denver Broncos, two years ago they became the first team in history to win all their divisional games on the road while they lost all their divisional games at home. Amazingly, they have a chance to repeat that incredible feat this year as they are 0-2 in the division at home and 2-0 on the road. The Giants are the real serial offenders here, especially when it comes to divisional games at home late in the season. Going back to their Super Bowl winning season of 2007, they lost to Dallas and Washington late in the season (although they did turn around and beat the Cowboys in Dallas in the playoffs). The next year, despite having the best record in the NFC, they lost to Philadelphia twice at Giants stadium, once late in the season and once in the playoffs. Last season, the Giants would have won the division if not for late season home losses to Dallas and Philadelphia. 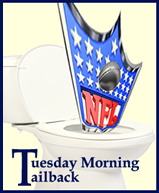 And then there was the pathetic game last night, which prevented the Giants from maintaining control of the NFC East. So what are we to make of this recent trend? Does it make all games more exciting but making them less predictable, or is it just a sign of rabid inconsistency throughout an ultra-mediocre league? We’ll see, as we head into the stretch run of the season.